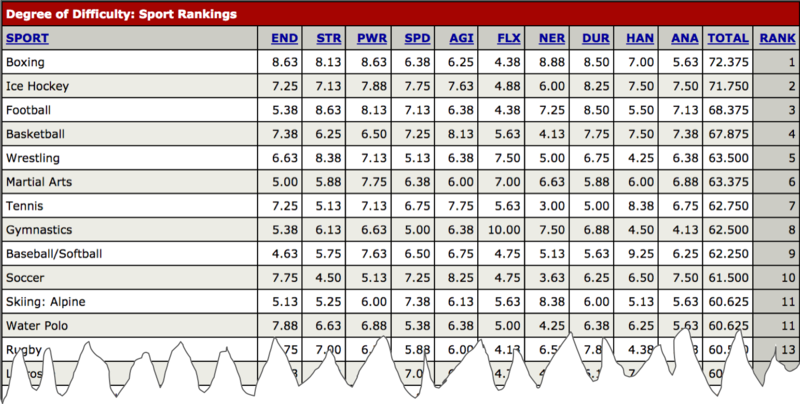 60 sports were rated by ESPN among 10 different skill-categories like endurance, strength, etc. The toughest sport is the one which has the highest amount of points when summing up all categories. This is hardly a visualization. Only numbers are being displayed in a table format. No visual elements are leveraged to facilitate comparisons. For example, balk charts or dot plots would be an intuitive choice here. The header of the columns only use abbreviations which are not clear on first sight. The audience has to move back and forth between the legend and the column headers to make sense of some columns. No key finding is picked up. No number is highlighted to raise awareness for, for example, an interesting outlier. I want to enable an easy comparison for the sport the audience is interested in, in each category among all sports. The sport which the audience picks via the drop-down menu is displayed by a larger bubble and colored in orange. Also, the selected sport is the only one which displays its points as data labels. The highest and lower values in each category are color-coded. The lowest in bright red. The highest in bright green.